JACKSON – Walters Group is nearing completion on the first eight-unit residential building at The Ponds at Jackson Twenty-One with occupancy slated for May. When completed, the 88-unit income-restricted community will be part of a much larger planned downtown-style neighborhood being installed in stages by various developers in northern Ocean County. The Ponds at Jackson Twenty-One is designed to achieve LEED® and ENERGY STAR® status and is expected to be 100 percent completed by October 2018. Located at 100 Mallard Court, the eco-friendly community will consist of 11 income-restricted buildings situated on 10 acres. When completed, the one-, two- and three-bedroom apartment homes will range in size from 854 square feet to 1,172 square feet. Rents will range from $465 for a one-bedroom to $1,275 for a three-bedroom unit. Each two-story apartment building will feature private entrances and upgraded interior finishes. The residents will have access to a large community clubhouse equipped with computer work stations and fitness center. Other amenities will include a children’s tot lot, barbecue and picnic area and basketball court. Another advantage for residents is the community’s location near local schools, shops, restaurants and recreation areas. The Ponds at Jackson Twenty-One will fill a need for income-restricted housing in the township as well as give priority to Sandy-impacted residents who have been displaced by or experienced major severe storm damage from Superstorm Sandy for ninety days after the certificate of occupancy is issued. A portion of the development was funded by the Federal Low Income Housing Tax Credits program, which has produced over two million affordable housing units nationally and over 50,000 units here in New Jersey. At the turn of the century, building a village where “nice people” can live, work and have fun became the dream of Mitch Leigh, the famed composer of the Broadway musical “Man of La Mancha” and its signature song, “The Impossible Dream.” He started buying land in Jackson more than 40 years ago. Leigh died in 2014 but his dream to build a self-sustained village lives on at Jackson Twenty-One. The mixed-use community will encompass nearly 1,000 acres adjacent to Exit 21 off I-195. Less than half of that acreage will be developed and the rest will remain untouched, according to Tom Bovino, manager of the ambitious project. The first phase of Jackson Twenty-One got underway in 2013 with The Gardens at Jackson Twenty-One. The 510-unit community is unfolding in phases with roughly 130 units already occupied. The next planned phase will be The Townhomes, 465 market-rate townhomes to be developed by a soon to be named public home builder. Construction is expected to get underway by year-end, according to Bovino. Jackson Twenty-One’s other projected phases will include another rental neighborhood, and many mixed-use neighborhoods that will combine office, retail and residential. For more information on Leigh’s vision, visit www.jacksontwenty-one.com. Prospective residents interested in The Ponds at Jackson Twenty-One can pick up an application at the welcome center, a single-story building at the corner of Route 526 and 527 in Jackson Township, open Monday through Friday, 9 to 4 p.m. Inquiries can also be made by contacting Randi DeGraw, Walters Group property manager, at rdegraw@waltersgroupapartments.com or call 732-987-9222. 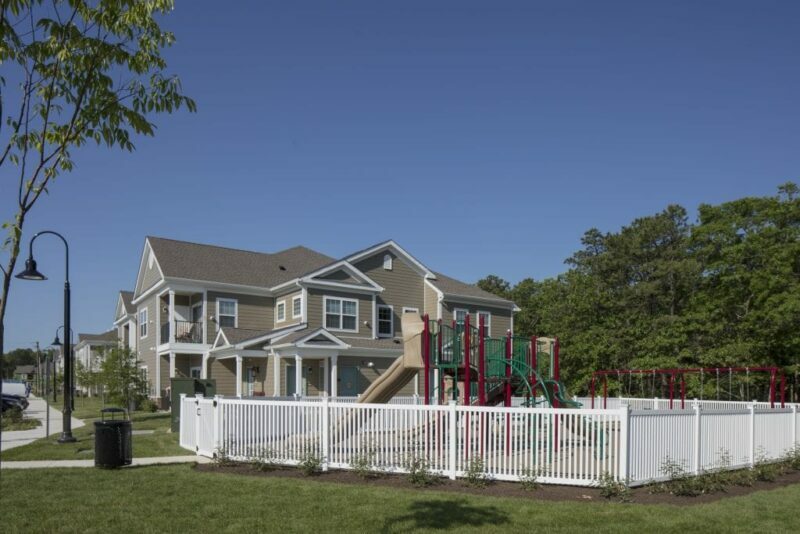 Walters Group has completed several income-restricted communities in Ocean County including, Cornerstone at Barnegat, Cornerstone at Lacey and Cornerstone at Toms River. Walters is planning the development of several similar communities throughout New Jersey. The Walters Group is the onsite property manager for all of the communities they develop. Photo Caption: The Ponds at Jackson will replicate the style of Cornerstone at Lacey, another Walters Group community.